There are some simple ideas and effects for unobtrusive website notifications. There are a lot of ways to show an unobtrusive message to a user: from the classic growl-like notification to a bar at the top of the viewport. There’s really no limit to making creative notification styles and effects but you should keep in mind that notification has to be a discreet message to the user, keep simplicity and subtlety in mind for the effect of appearance and also the disappearance. 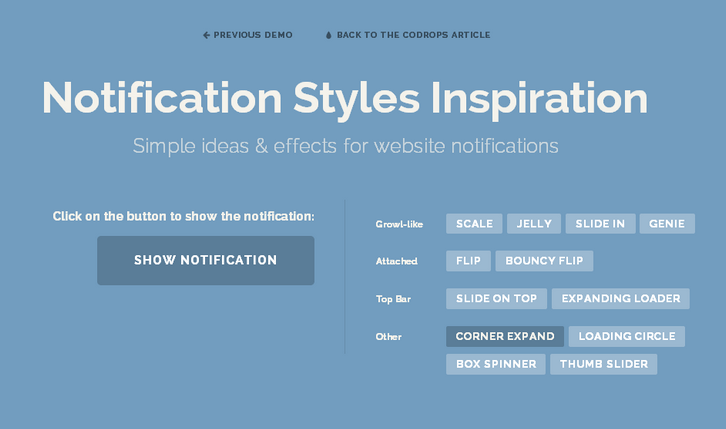 Codrops has shared a small set of Notification Style Variations that use CSS animations for showing and hiding the notifications. Some of them are preceded by a dummy loading animation, which could be a nice idea for specific actions that require some time in a system. Wow, those look pretty great. Thanks for sharing!